The Emmy-nominated actor keeps playing men so bad you fall in love with them, so here's how he does it. For Walton Goggins, the worst part of transforming into Lee Russell wasn’t getting frosted tips; it was covering them up. Don’t be misled: Goggins didn’t care much for the look (“It’s a lot to live with”). But one night during production of the HBO comedy “Vice Principals,” he went out to dinner in Charleston, South Carolina with a few members of the team, including co-star (and co-creator) Danny McBride and his director, David Gordon Green. Though it went against his set of manners, Goggins just couldn’t bring himself to sport his character’s famous blonde highlights in public. But the “distinguished older gentleman” who spotted him that night didn’t know anything about Lee Russell. This was 2015. “Vice Principals” had yet to debut. All that man saw was a hat on top of a head inside of a dining room. It may seem like the point of this story is no one should wear a hat inside a restaurant (especially in the South), but really the key takeaway is how much Goggins did not want to be Lee Russell — not when he didn’t have to be. Fans of the two-season series know Russell as a maniacal, power-hungry, sociopath; a vice principal who covets the boss’ chair so much he’ll stop at nothing to make it his own. He blackmails his competition; he spits in his co-workers’ coffee cups, then lies about it; he even burns down his boss’ house, where she lives with her children. And yet Goggins found a way to make Russell engaging, hilarious, and even, at times, empathetic. He threw himself into a role that demanded a certain surrender, and trusted the process to produce someone the audience would become attached to and even root for (though they likely hated themselves for doing it). Goggins has done this before. Be it his sterling supporting turn in Quentin Tarantino’s “The Hateful Eight” or his Emmy-nominated role in “Justified,” Goggins makes bad guys fun to watch. Goggins’ performance in “Vice Principals” drills deep into the heart of the very man he didn’t want to be, and it made the show that much better. 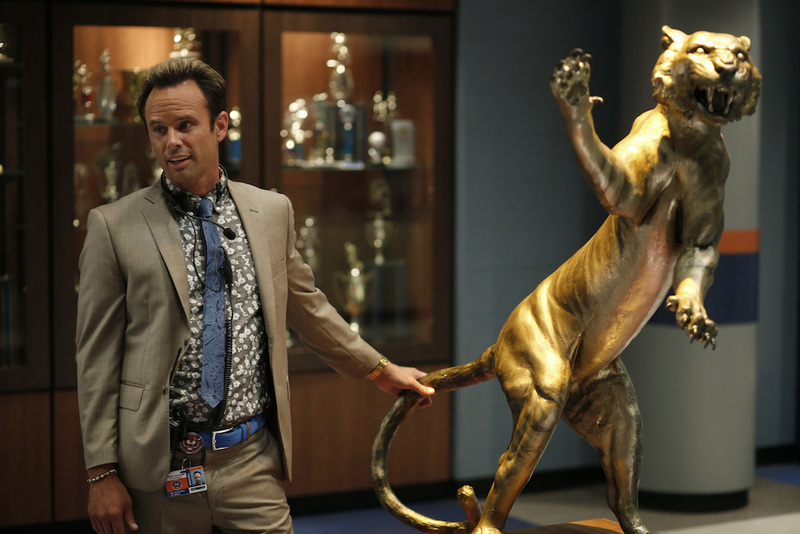 Referencing a scene in the penultimate episode where Gamby chases Russell through the halls of their high school, Goggins said he didn’t have to think about the choices he’d make, even if some were improvised. Crediting the trust he had in McBride, Green, and co-creator Jody Hill, Goggins said he could find things in scenes as they came to him, including an improvised line that cut to the core of both characters. Russell said he still thinks about where Lee Russell ended up after the ambiguous series finale — “But I won’t tell you,” he added — and he’d be open to returning to the character in the future.